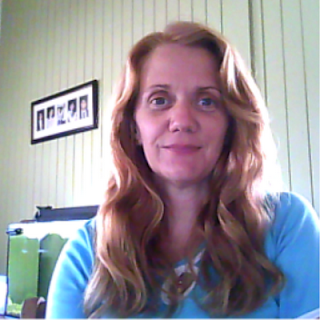 After many requests (one) (from River) I've decided to post a pic of my hair PRE-straightening. This is quite traumatic for me. And it might be for you, too -- if you're easily frightened, click away NOW. Well, don't say I didn't warn you. This is after using the bicarb/vinegar treatment, and allowing it to dry naturally overnight. I can't (ever) get a brush through it and if I did I'd look like the worlds' largest dandelion, so it's completely au naturel. It looks like this if I put half a bottle of conditioner on it, too, so don't blame the experiment. Now, by way of comparison, here is my sister with her experimented-on-for-more-than-a-year hair. Now, before she started using the no poo treatment, her hair was like straw. It wasn't frizzy like mine, but really dry and brittle, and it had no shine, at ALL. I think it's fair to say that it looks FANTASTIC now!! pour onto wet hair, massage in, rinse out. I'm going to try with the honey, next time I wash. Who knows, it may even make me sweeter. Toni, the unstraightened hair doesn't look too bad at all, I've seen worse. But I can see that the "dandelion-after-brushing" look isn't appealing. My hair does a similar thing, so I don't brush. I've used only a comb on my hair for the last twenty years. Your sister's hair looks lovely, did it take a full year to get to this condition? Or did it happen sooner and now she's just maintaining? I'll have to leave that to my sister to answer, River -- I'm not sure how long it took, but it certainly wasn't a year. hello gang. the sister here. the condition got better pretty well instantly, however the softness is 'growing in', so that after nearly 2 years it feels really nice to touch to about 2 thirds of the way down. i figure after 5 years pretty well all of my hairs will have never been 'over the counter poo'ed' and will ALL be soft. thanks for the compliment, and give it a try! I am soooo trying this on hubbys hair! He has so much dandruff it annoys ME! I might even give it a go on my hair. does it matter if it is coloured (the hair)? It might take some time to feel soft Chik, but I don't imagine the treatment will strip colour out. It's very gentle. It costs around $2 a bottle and my hair has always been soft, shiny and dandruff free. *disclaimer, I almost never colour it, don't own a hair dryer or straightener, and I avoid the sun as much as possible, which may also contribute to the condition of my hair. just chipping in here, no-one does have gorgeously shiny straight hair, which grows at the rate of about three miles a week* and I'm insanely jealous.